These rental cabins in Sheridan are perfect for a weekend or over night stay to enjoy everything that Splashway has to offer. 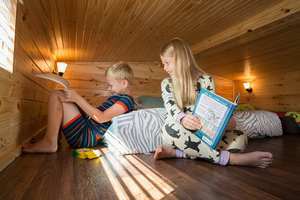 Relax and unwind in a cabin at Splashway Waterpark & Campgrounds. Why not turn your daycation into an awesome staycation? 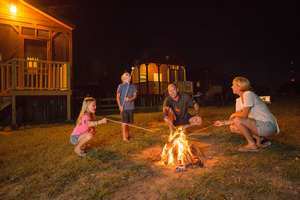 Your family can enjoy some fantastic activities in the campground including s'more nights, movie nights, arts and crafts, live music, hay rides, nature trails, paddle sports, fishing and much more. The cabin offers everything you need to ensure you have an awesome family vacation. Each cabin sleeps up to 12 and has a full kitchen with dishes, silverware and even cookware, satellite tv, central air and heat, a full bathroom, master bedroom and a sleeping loft. Sit out on the screened-in porch of a cabin and watch the white tail deer come right up to the feeder. The cottage is a perfect choice for families of 6 or less. Each cozy cottage has satellite TV, a shower, bathroom, mini fridge, air conditioner, coffee pot and a microwave. Both the cabin and cottage come with a picnic table and a fire ring for grilling or sitting around the fire under the big Texas sky at night. 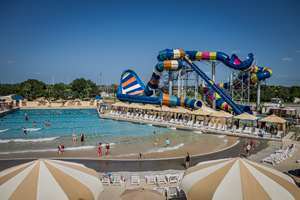 Both the cabins and cottages are within walking distance of the Waterpark which is loaded with lots of thrilling rides. Come create memories of a lifetime at Splashway Waterpark & Campgrounds.